Dr. Tracy Patterson is Assistant Professor of Saxophone/Jazz at Winthrop University where he directs the WU Swingin’ Eagles Jazz Ensemble, teaches applied saxophone, and coaches chamber ensembles. Patterson received the Bachelor of Arts in Music from Northeastern State University, the Master of Music in Jazz Studies from the University of Central Oklahoma, and the Doctor of Musical Arts in Saxophone Performance from Texas Tech University. He has performed with noted artists Natalie Cole, The Temptations, Robin Eubanks, Bob Mintzer, Wayne Bergeron, Steve Lippia, Linda Eder, Lorna Luft, Brett Eldridge, and Darius Rucker. An active orchestral musician, he has appeared multiple times with the Charlotte Symphony Orchestra, the Oklahoma City Philharmonic, and the Lubbock Symphony Orchestra. Patterson is a Performing Artist for Yamaha and D’Addario and exclusively performs on Yamaha Saxophones and D’Addario reeds. He resides in Tega Cay, South Carolina, with his wife, Joy, and their daughter, Evelyn. Duo Holsten was formed in the summer of 2017. 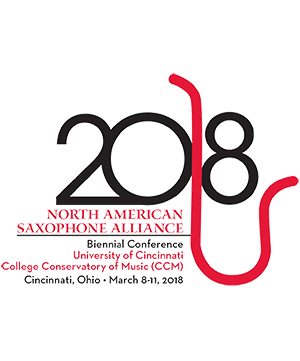 Saxophonists Will Campbell (Professor of Saxophone/Director of Jazz Studies at UNC Charlotte) and Tracy Patterson (Professor of Saxophone/Jazz at Winthrop University) have been performing together for over a decade in ensembles such as the Charlotte Symphony Orchestra and the Carolina Saxophone Collective. 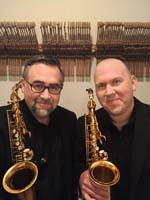 Duo Holsten is committed to promoting jazz in the atypical setting of a saxophone duo, through compositions that embrace chamber music and improvisation without the presence of a rhythm section. The limitations of only two musicians also celebrates the sophistication of counterpoint and allows for greater spontaneity, rather than the experience of the traditional jazz chamber instrumentation.